A unique and thorough investigation of the shift towards Europe-wide energy regulation, markets and business strategies, and the extent to which energy systems have become more liberalised over this period. 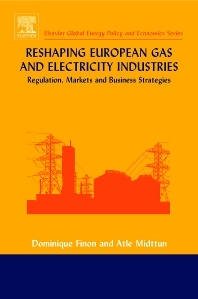 Reshaping of European Gas and Electricity Industries analyses the key issues facing the European energy industry, from a regulatory, market, and business perspective. Current challenges within the field are also reviewed, including competitive and environmental issues.